Arizona is extremely dry for most of the year. Most people hear the word 'Arizona', and they immediately think of the desert or the Grand Canyon. But Arizona has some of the best waterfalls in the United States. Fossil Falls is a pristine, emerald green waterfall located in Arizona’s Coconino National Forest. I've hiked all over the Southwestern United States and I've never seen another waterfall quite like it. The falls are only about 25 feet tall, but they are fed by an underground spring and the volume of water in the creek is impressive by any standard. 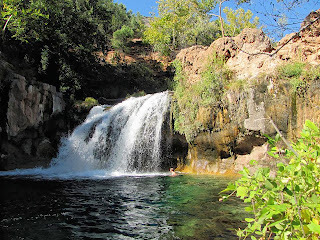 Fossil Creek also has some of the best swimming holes in the Southwestern United States. 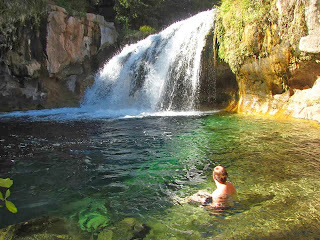 There are caves you can swim inside, rocks to climb, cliffs for jumping and plenty of sunny spots for lounging and picnicking along the creek. In the summer, you can expect that Fossil Falls will be very crowded. The reviews on Yelp make it sound like a madhouse. Several reviews mentioned open drug use and college kids partying and blasting music. My girlfriend and I made the hike on a weekday in October of 2013 and we never ran into a single other person on the trail or at the falls. It was absolutely glorious. We had the entire place all to ourselves. The large amount of calcium and dissolved minerals in the water gives Fossil Falls its distinct turquoise color. The pictures barely do it justice. Fossil Falls is absolutely breathtaking when you see it up close. The hike, although daunting, is beautiful too. The best part of the trail definitely starts when you reach the floor of the canyon and hike along the creek. There are several camp spots cut out of the underbrush. According to the Parks Department, camping is permitted along Fossil Creek South of the Fossil Creek Bridge. Your campsite must be at least 100 feet from the creek and fires are strictly prohibited. I easily could have spent 2 or 3 days camping in the canyon and had a great time. The road from Strawberry Arizona to Fossil Falls is closed until further notice. This leaves two options for reaching the falls. You can either hike 8 miles round-trip into the canyon, or attempt the notorious 16 miles dirt road. I've read in many places that you must have a truck or 4-wheel drive to do the road. We opted for the 8 mile hike. The hike starts at the top of the canyon. You steadily descend for over 3 miles until you reach the creek. You hike upstream for approximately 1 mile until you reach the falls. There are also several smaller cascading waterfalls and swimming holes along the creek. This hike was easy in October with 70 degree temperature, but I bet it would be murderous in the summer. My legs were feeling the burn on the return trip. I went through 4 bottles of water. In the summer, each person in your group would probably need a gallon of water to complete this hike. From Payson: Travel north on AZ-87/260 toward Winslow for about 17.5 miles to the small town of Strawberry. Turn left on Fossil Springs Road (FR708). Continue approximately 4.5 miles and make a right onto the Fossil Springs Trailhead and parking area at the top of a small hill. The trail is approximately 8.5 miles round-trip to the falls and back. From Camp Verde: Travel east on AZ-260 for about 7 miles to signed turn for Fossil Springs Road (FR708). Proceed 16 miles on rough dirt road to any available parking area. This road is rough, but passable in a passenger car in dry weather with a skilled driver. High-clearance vehicle would be preferred for quality of ride.